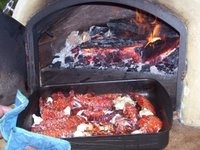 This section offers a few tips on cooking in your woodfired oven. It also contains the favorite recipes of workshop participants, who have built their own oven, and owners of ovens which have been privately built. It will take approximately an hour in which to heat the floor properly for pizza cooking and probably 2-3 hours for roasts and bread, especially if there is a ‘heat bank’ beneath the floor. Push the fire or coals to the back or side for pizza cooking leaving the door open. For bread or roasts the fire can be removed or allowed to die down, the doorway shut and the damper [if the oven has one ] closed, allowing the stored heat in the floor and dome to do the cooking. 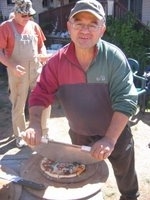 While pine can be used for initial heating it is better to cook with non- resinous woods, for pizzas. Hardwoods such as black wattle, red gum and the boxes are preferred, or those woods which are known, in the local area, as being good for wood fired stoves or open fireplaces. If a chimney has a damper gradually close off the draft as the flames burn down to conserve the heat in the oven. If using pizza trays oil the trays well , preferrably with olive oil, before placing the dough on top. Keep the tomato paste and cheese away from the outer edge of the dough. If they melt onto the tray it forms a ‘glue’ which makes separation difficult. To crisp the base slid the pizzas off the trays, when the cheese melts and the dough browns, onto the floor for the final stage [about a minute should do]. To keep your trays in good condition always remove the pizza to a cutting board before slicing. A 'wheel' cutter or a 'crescent' cutter is easier than a knife. Avoid cleaning aluminum pizza tray in automatic dishwashers as the caustic dishwasher powder makes the surface of the trays dull and less slippery. Better to hand wash the trays with a little detergent and warm water. Try placing the pizzas direct to the floor using a small wooden bat or metal peel. Semolina or coarse flour beneath the pizza can act as a ‘slipping agent’. Drain ‘wet’ ingredients well, such as pineapple, marinara, tinned corn and asparagus, and don’t overload the toppings as it prevents the center from cooking properly. Use a brass broom or ‘scuffle’ [damp mop] to clean the ash from the floor before sliding the pizza directly to the floor. Some pizza toppings can be added late in the cooking process such as fresh leafy herbs [basil, rocket etc. ], otherwise they will dry to a crisp and loose their pungent flavour. Mike is not only a very capable fisherman but certainly knows how to cook his catch. Rub each fish cavity with salt and insert chopped filling ingredients. Sew or skewer the opening closed. With a sharp knife cut 3 slits, across the fish diagonally, on both sides. Rub the fish with the marinade mix. 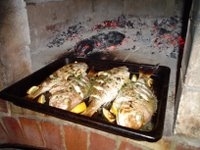 Arrange the fish on an open oven tray, with some lemon wedges if desired, and place in the wood fired oven at moderate heat, basting occasionally with olive oil. The fish will be cooked when the flesh turns opaque white and on removal from the oven can be sprinkled with chopped parsley. Serve with green salad, crusty bread and a lemon wedge. Cherry and Colin hosted the Dromana workshop and in their new brick oven quickly extended their menu from traditional pizza dishes to something more exotic. Here are two of their successful dishes. The boned leg of lamb is stuffed with a mix of chopped onion, dried fruit, cardamom, chopped parsley and cooked cous cous, wrapped in aluminum foil and placed in a lidded cast iron pot. This is then placed in the oven at about 300 degrees celcius for about 2 hours. As an accompaniment a shallow steel tray of firm tomatoes, topped with a basil pesto, is roasted near the coals, occasionally being turned and drizzled with olive oil. Their other favorite is a Tandourie Chicken dish slowly cooked, in a lidded cast iron pot, over 7 hours with the oven at 190 C degrees, diminishing. Kate and Rick were both participants at the Glenlyon workshop and at the end of the weekend bought the high tech. 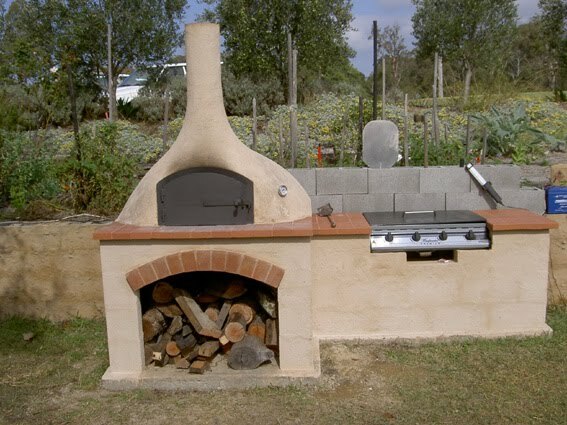 oven, which was built on a steel frame. Once the oven arrived at their home they built around the steel frame with a brick structure which incorporated a large working surface and wood storage beneath. They have developed an unusual specialty for a wood fired oven. 1 cup or more of smoking chips or coarse hardwood sawdust, soaked previously in water but now moist. Mix salt, sugar and parsley and spread over fish which is then covered in a tea towel and placed in the refrigerator for no longer than 12 hours. Prior to smoking rinse the fish and pat dry. Place the fish in the oven on an elevated wire rack, skin side down, with drip tray beneath. Place a handful of wood chips on the coals at about 120 - 140 degrees C and close both door and damper tightly. The fish can slowly smoke for up to 2 hours in diminishing heat, but it may be necessary to add some more wood chips to the coals during that period. Rick suggests wrapping the smoked fish in baking paper and placing it in the fridge for 24 hours before eating with fresh salad or adding to a pizza with pizza sauce, capers, bocconcini cheese, spring onion and some grated cheese. Sounds delicious! [which he says it is]. Phil and Rachel are friends and neighbors who often make use of the stored heat in their oven, especially after a 'pizza afternoon' with friends, to cook dishes that remain in the oven overnight. The slow diminishing heat of the oven gradually cooks these dishes to perfection while they sleep. Phil, an IT expert [and responsible for the creation of this website] has spent much of his working life in exotic places, on diplomatic posts, especially in the Middle East. Maybe it is because of this background that has led him to become an aficionado of long, slow, meat roasts. Phil's most successful slow overnight roast was a leg of lamb with it's plastic wrapper still enclosing the joint. The meat was delicious and tender, however this form of cooking is definitely not recommended! Phil's wife, Rachel, is an excellent cook with a special interest in Near and Middle Eastern foods. It was during their their time in Syria and Pakistan that has led to Rachel's creation of delightful spicy, aromatic and flavorsome dishes. A recently acquired Moroccan Tajine cooking pot will be trialled in their wood fired oven. For slow food the Tajine might be an additional useful implement for wood fired oven cooking. This dish might be beyond the means of many but Ray lives near the sea, in Perth, has a boat, a licence and a particular passion for catching crayfish. This is one of his favorite dishes he serves to guests, apart from pizza , spare ribs and a special summer candied fruit dish, all cooked in his self-made wood fired oven. This dish uses a scanpan or other heavy cast iron oven pan to retain an even heat. Cut the crayfish tails longitudinally and devein the half that requires it. Lay the tails, shell side down, in the lightly oiled pan and pour over a small jug full of garlic butter. Place in the oven about 200 - 250C rotating the pan occasionally to make sure it cooks evenly. When the crayfish flesh changes colour from opaque to white [ 4-5 mins.] remove pan and turn tails over to have the flesh side down. Return the pan to the oven and cook for only another 2-3 mins. Avoid overcooking as the flesh will dry out. The flesh can be served as is or with your favorite sauce. Can't wait to be a guest! 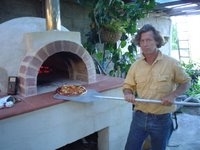 Pete removing a pizza from a traditional brick oven built during the 'Grevillea Winery', Bega, Workshop. The fire has burnt down to bright burning coals. Milan using a homemade stainless steel 'crescent cutter' to divide a pizza. The workshop high tech. 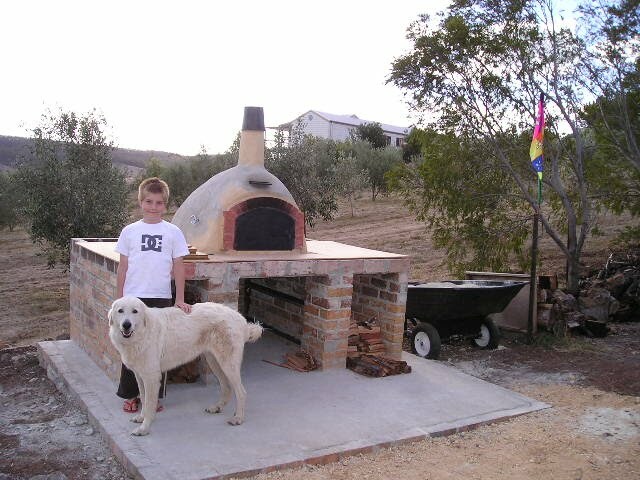 oven finds a new home at Kate and Rick's olive farm. 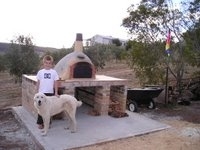 It is in this oven they have developed their smoked food specialities - an unusual approach for a wood fired oven. 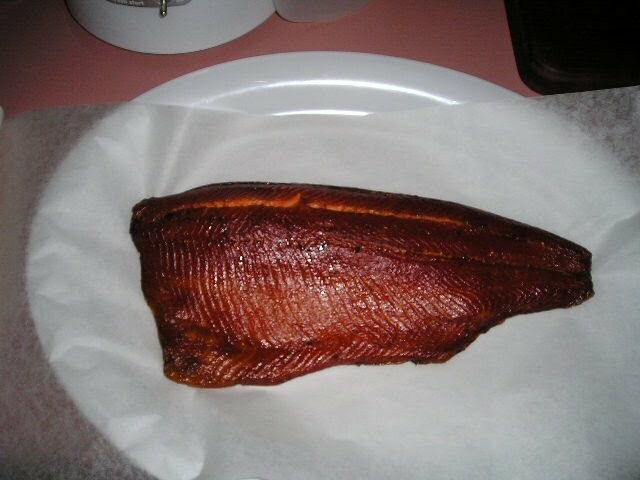 A beautifully smoked fillet of ocean trout smoked in Kate and Rick's wood fired oven. Phil and Rachel's oven and gas barbeque combination. It is this oven that is use to slowly cook 'overnight' dishes.